Hero 7 Black Unresponsive, cannot turn off etc. Apologies if this has been covered but I can't find and exact match to the issue I am having on the forum. I have tried formatting the SD card, resetting the camera and updating the firmware. Love the quality, vidoes etc of the Hero 7 black, but there are major issues with powering it off, and the screen becomming unresponsive. please see below. The issue appears to be when trying to power off the device, it then powers back on, the screen controls and physical buttons do nothing at all. The screen moves and shows what the camera is pointing at, but it completely unresponsive. If anyone has any ideas, or if GoPro themselves can comment or get this resolved ASAP that would be great. This shouldn't happen on a premium "market leading" product of this price range. 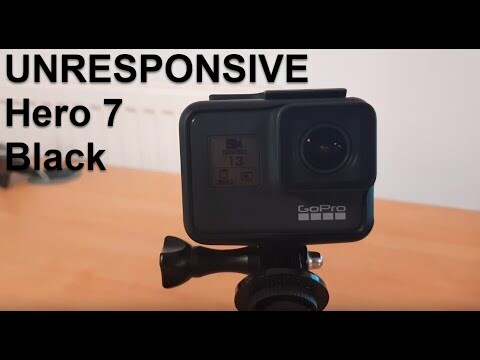 GoPro Hero 7 Black becomes unresponsive after trying to power down. Re: Hero 7 Black Unresponsive, cannot turn off etc. Same issue here. Repeatedly gets into non-responsive state. Fails to power down. Camera gets hot. Lots of battery pulls. Very frustrating for an expensive product. did you make a manual software upgrade? follow the "manual update link"
introduce the microSD card in the camera. be sure you have enough battery >50% let's say. wait for the upgrade to finish. - I recorded more than 70h of video, all 4K, with and w/o Protune, w and w/o stabilization - no more freeze, no more issues. Hi Robert. I haven't tried manually updating yet. I updated to the latest version via the android app. I will give this a try as soon as I get home and will post back once I've had a chance to test it. I have performed the manual update using the steps provided and have exactly the same issue. Unfortunately, I am considering asking for a refun on the camera now as the price tag of this product is too high, and should not have issues like this at all. If the manual update did not clear the issue, please reach out to our Support Team. Please have your camera's serial number and proof of purchase ready. Just to make you all aware. GoPro support beleive this is a software issue and have asked me send it back to them (Netherlands). I have the same issue. Unresponsive and draining battery which makes it getting so hot I think it's really dangerous especially when I kept it in a bag NOT knowing that it was actually still ON!!! Battery got so HOT that when I pulled it out and changed to a new battery, I could not hold that hot battery long in my hands! When are we getting UPDATES for this problem?? Are we getting any??? It has been the problem apparently since last year like probably since over 6 months ago?? !